Biography: Although born in Kansas City, Missouri in 1947, Gary Ozias spent most of his early years in rural Massachusetts. He has been interested in painting and other visual arts since he was a young boy. He has also lived in Colorado, Missouri, and Kansas. He and his wife Lee now reside in Las Cruces, New Mexico. He has two adult daughters, Moira and Megan. His father Stanley was a master engraver and gave Gary much of his early encouragement and training. After putting his art aside for a number of years, he picked it up again in the late 1970's, and has been drawing and painting ever since. He began his professional art career in Kansas by opening an art gallery and studio in 1983, but he continued to devote most of his energies to his teaching until his retirement in 2001. Since then, he has painted full time, both outdoors and in the studio. 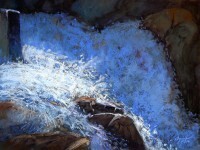 He has won numerous awards and recognitions for his painting. His work hangs in public and private collections from coast to coast in the United States and also in other countries. He has worked in a variety of media, including pastels, oil, watercolor, and pencil, as well as pen and ink. His work is representational but also has a painterly touch to it. He loves to capture the essence and feel of the weather conditions which envelop a landscape. His subjects range from wildlife to landscapes drawn from whatever locale he happens to be in. He sometimes does commission work when called upon, and his pieces find favor with jurors and purchasers alike. He considers himself fortunate to be able to paint full time, doing the thing that he loves. He hopes that others may find the same enjoyment from viewing his work as he does in painting it. 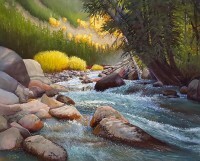 Artist's Statement: I enjoy painting the natural world whether the subjects are landscapes, seascapes, or wildlife. I strive to catch the real essence of a scene, but my style sometimes borders on impressionism. I really love the process of seeing a painting come together from the first, rough paint marks to the finished piece. I like the outdoors and spend time observing its moods. There is nothing better than to be out painting on fresh, breezy days, and I am thankful for the opportunity to do something that I enjoy so much. If I can capture the mystery of foggy mornings, the essence of hot, summer evenings, or the sunrise on new snow, I consider it a success. Every painting is a new challenge and tends to keep one humble. My goal is simply to be absolutely the best painter I can possibly be and let my work speak for itself. I hope others enjoy the results as much as I do the process.